Arid land bird populations are in decline around the vicinity of oil and gas wells in Wyoming—but, not for the reasons you might initially think. While such development has encroached on and hindered nesting habitat for three types of sagebrush-obligate birds, predation of these birds has increased because rodent populations in the vicinity of oil and gas wells have increased, which has, in turn, increased nest predation. 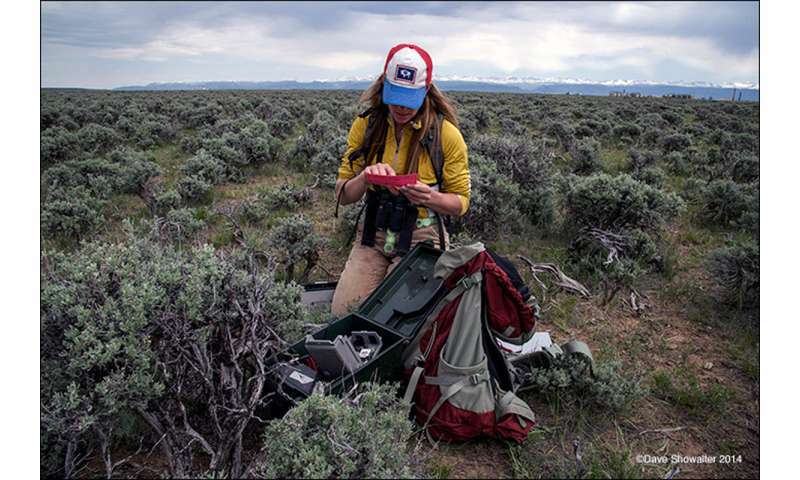 Anna Chalfoun, a University of Wyoming associate professor in the Department of Zoology and Physiology, and assistant unit leader of the Wyoming Cooperative Fish and Wildlife Unit, and her graduate students have been studying and collecting data about three species—the Brewer's sparrow, sagebrush sparrow and sage thrasher—in Wyoming for seven years. 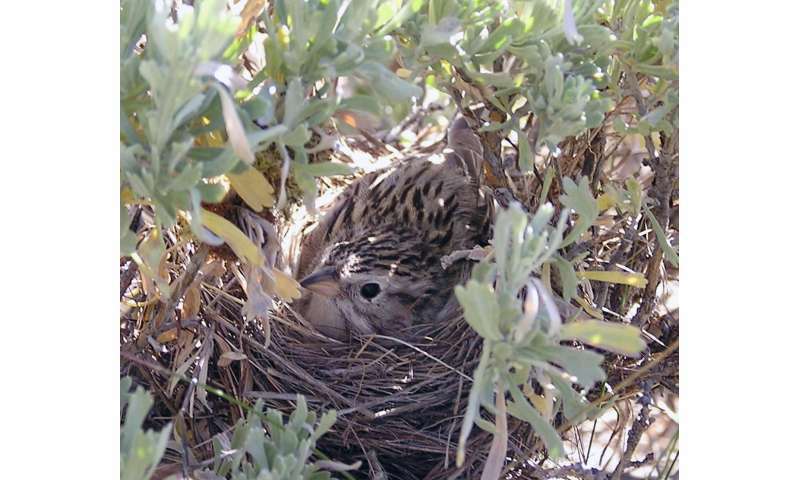 These birds use sagebrush for cover to build their nests on the ground or low to the ground within the sagebrush. The study, which began seven years ago, has taken place at six sites in Jonah Field and six more at the Pinedale Anticline in western Wyoming. "We found the majority of nest predators at the nests are rodents. Rodents are more abundant where there is natural gas development," Chalfoun says. "We tested the hypothesis that rodents were more abundant surrounding gas fields because their main predators (raptors, coyotes and badgers) avoided gas fields, but our data did not support this idea." vLindsey Sanders, a UW master's student in zoology and physiology from Boulder Creek, Calif., conducted work on the above hypothesis, Chalfoun says. Besides mice, these rodents include two species of squirrels—Uinta ground squirrels and the 13-striped ground squirrel. "We are now continuing to try to figure out why the rodents are in the natural gas development areas where there is (nesting) habitat loss," Chalfoun says. "We are seeing more rodents. We are not sure why they are drawn to those areas. Another hypothesis is that they are receiving food subsidies from the sometimes novel types of plants that establish in the reclaimed areas surrounding well pads and along pipeline scars." Sagebrush songbirds settled areas with more surrounding natural gas development, simultaneously or earlier than areas with less natural gas development. The birds settled there even though nest predation rates were higher. Their nesting period runs from May through late July. "Do songbirds prefer to settle in habitats that are not in gas fields? The answer is 'no,'" Chalfoun says. "Birds come from their wintering grounds just to breed. Songbirds apparently are not able to assess they are going to have higher nest predation there. "We've found that birds select sites with less energy development and lots of energy development at the same time. There's no pattern to settling areas with zero surrounding wells and areas that have tons of wells. As long as there are patches of significant sage, they are there. Yet, the birds are less successful at reproducing in gas well areas, suggesting these areas may be serving as ecological traps." Detection of most rodent species increased with natural gas development. One current hypothesis is that a number of sheds on property where natural gas fields exist have drawn in the rodents, who use the structures for protection, warmth and to build nests for their young. This behavior, in turn, may be attracting more predators of the rodents, Chalfoun says. "In places like the Jonah Field, there are lots of little sheds and structures," she says. "What if this is providing a source of rodents that depredate nests? If the infrastructure is harboring the rodents, do we go and put out traps?" Rates of nest predation increased with local rodent abundance. From 2011-16, 93 percent of predation to Brewer's sparrows was caused by rodents. Of 44 predation events captured on infrared video camera, 24 were by deer mice. Chipmunks accounted for 11 nest deaths, while ground squirrels were responsible for six casualties. The loggerhead shrike, a type of bird, was responsible for the other three deaths. During the same time period, 60 percent of predation of 23 sage thrasher nest depredations caught on camera was caused by rodents, including deer mice (eight), chipmunks (eight) and ground squirrels (four). Badgers were responsible for six deaths and magpies two. A raccoon, loggerhead shrike, American kestrel, short-eared owl and northern harrier each accounted for one death. "I get jazzed to know what's going on," she says. "The mice are so aggressive. They sometimes suffocate and take the nestlings out one at a time. We've found the majority of nest predators at the nests are rodents. "We started this because state and federal agencies, such as the Wyoming Game and Fish Department, and the U.S. Geological Survey, were interested in the effects of habitat change on nongame species of wildlife," she says.